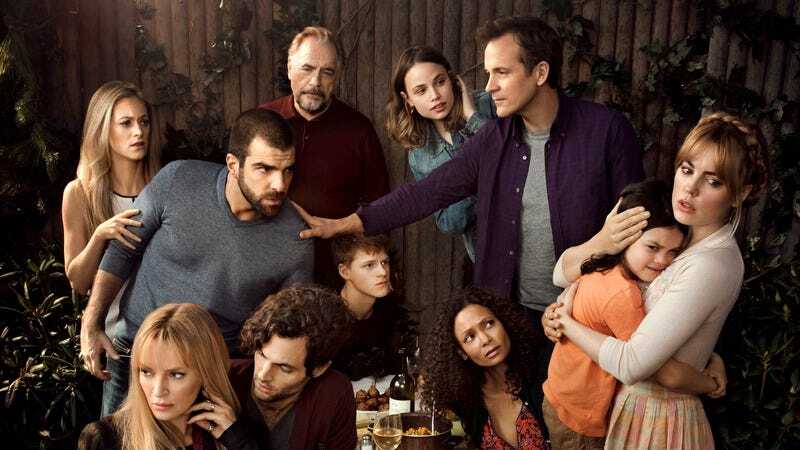 As a parent, I was fascinated just by the premise of NBC’s recent miniseries The Slap, which follows the aftermath of one parent (Zachary Quinto) slapping a bratty child who isn’t his. There’s an unofficial line at my neighborhood playground that never gets crossed: No one even reprimands someone else’s kid. I’ve spent enough time with other parents to know when my views vary widely from theirs, from whether to allow a candy treat before bedtime (insanity) to a ban on screentime during the week (also insanity). But for the sake of all friendships, at the kid level and the adult level, we all silently agree to disagree. I also grew up in an age when the evil nuns at my south side Chicago Catholic grade school almost gleefully hit us with rulers and yardsticks. Corporal punishment, a few decades ago, was far from the line-crosser it is today, as The Slap makes abundantly clear. Here’s what gives all of these differences so much weight: Nothing is more important to parents than their kids. This turns mere candy disagreements into life-and-death matters. So it’s no surprise that the titular incident affects all of The Slap’s players so much, each in a different way. But as The Slap focuses on a different character every week, it soars far past the actual slap. We see how Anouk (Uma Thurman) still wrestles with the parental rejection she received from her mother Virginia (the magnificent Blythe Danner) as a child. We see aging patriarch Manolis (Brian Cox) go all out to mend the crisis that threatens his family. We see children at many age levels: from young Hugo (Dylan Schombing) to teenaged Connie (Makenzie Leigh) and Richie (Lucas Hedges). As these generations interact, The Slap deftly and painfully shows how parenting is not only the hardest gig in the world, it’s also the most vital, and the most rewarding. The ties we have on either side of our generational level are the most important ones we’ll ever have, and The Slap paints these emotional portraits in a manner that’s moving, not cloying. I was shocked to find myself choking up at some point in every episode. By fleshing out these parents beyond just good or bad—past the imperfect but always well-intentioned Bravermans of Parenthood, for example—The Slap offers a much more well-rounded view of parenting than one would expect at first glance. (Maybe the show’s title, from the book of the same name and the Australian series that preceded this one, did it a disservice, setting it up for any number of headline puns.) TV parenting usually involves delightfully precocious moppets and momentarily anguished tweens who come back around by the end of the hour. The Slap shows that there are about as many different ways to parent as there are people, from raising your child as an “equal” with no time-outs to pushing and always demanding the best from your child, no matter what the consequences. As the patriarch from the elder generation, Manolis takes it upon himself to fix his family’s problems, even though he is informed by his understanding wife that the kids no longer need them: “You dispense advice like some kind of wise man…[but] there’s not much more we can do… We’re on our own now. They don’t need us anymore.” Manolis’ Greek ethnicity is used to underline the strength and importance of the familial structure, but really, it applies to any generation. Manolis and his wife then sit and ponder what their lives will finally be like now that this all-important focus has subsided. But, as future episodes point out, it hasn’t, really. When Hector needs advice on his flirtation-gone-too-far with teenaged Connie, he finds his father in a bar playing backgammon with his cronies. For Hector, his long-understanding father is the perfect—perhaps the only—person he could come to for advice. And Manolis greatly appreciates the fact that his adult son still seeks him out. No one, not even Harry, is painted in merely good or bad lines on The Slap. After all, Harry gets involved in the first place to protect his son from Hugo swinging a bat at him. As horrific as Rosie appears when we first see her—breast-feeding her pre-K-aged child in full view of everyone (the first thing I thought of is how possibly traumatizing this would be for the young actor)—she also reads her son The Velveteen Rabbit in bed. Hector is introduced as “the best man in America,” but his dalliance with a high-schooler is anything but moral. It’s implied that Connie’s dangerous crush on Hector is the result of her loss of a father figure, since her now-deceased rock-star father left her family when she was very young. Compare this dense lineup to NBC’s recently departed longtime drama, Parenthood. The show dealt with some dark times and difficult issues: Joel and Julia’s breakup, Kristina’s cancer, Max’s autism, Amber’s various crying jags. The impressive cast played off each other organically, like a real family, and many times, generational battle lines were drawn. But in that lovely, bright California setting, none of these conflicts ever really stuck: Joel and Julia got back together, Kristina’s cancer went into remission, Max’s parents built him his own school. All the Bravermans had such a rock-solid bond, they benefited from a giant and immense support system for each other, which really comes in handy when you’re trying to build your own family. Witness Julia’s first night as a single woman when she’s visited by all of her siblings, Crosby and Adam’s business partnership, or Sarah, Julia, and Kristina’s girl talks over glasses of wine. The Slap shows a world like that with many of those ties dissolved. Our setting shifts to Brooklyn, with darker rooms and much less light. Fights and breaks happen, and as in real life, there is absolutely no guarantee that they will ultimately be resolved. I haven’t seen The Slap finale, but no matter what happens, all of these families have been torn apart and have yet to be put back together, as this event dismantles them all. But what The Slap and Parenthood both emphatically state is how much these personal networks rely on each other; the losses in The Slap wouldn’t be as pronounced if those ties weren’t there to begin with. My parents are deceased, and I miss them every day, but never more so when I am trying to parent. And it is a different world today. I’ll never forget the time I asked a kid, who had been on the swing on the playground for quite a while, if my toddler could take a turn. When I was growing up, when an adult said something, you did it, no matter who the adult was. This 4-year-old pretty much rolled his eyes at me until his nanny ran over, embarrassed. Just this morning, I had a shouting match with my second-grader about teeth-brushing: He: “I brushed my teeth!” Me: “Brushing your teeth for two seconds does not count!” I don’t remember having shouting matches with my parents about tooth-brushing, but as his parent, this is my failing, not his. My husband asks me all the time where this autonomy comes from in this younger generation. Maybe it’s because our kids and their classmates are growing up calling their parents’ friends by their first names. I can’t even tell anymore. But I don’t think this makes the job any harder than it was for my parents. My great takeaway from The Slap, and from life, is that parenting is the hardest job there is. It’s so difficult that there’s no way to prepare for it. It’s like when Rosie tries to describe her post-partum depression: “How do you describe a car crash?” As The Slap so carefully displays, the parenting scale contains many and wide variances, with very few definitive boundaries that cross into “bad” parenting. When Anouk despairs to Aisha that she doesn’t know how to be a parent, Aisha answers quite rightly, “Nobody does… I screw up as many times as I don’t.” The most painful lesson for kids is when they learn how imperfect their parents really are: Fortunately, amazingly, they give us a brand-new chance every day to make things right. It’s a 24-7 job that appears to lighten when the kids finally leave home, but as The Slap points out, is never really over. As Manolis and Virginia know full well. That’s a terrifying notion, but also a heartwarming one. Long into adulthood, when something happened to me, either good or bad, my mother was often the first person I thought of to call. I only pray that I will hold the same ranking for my own kids. In the meantime, my husband and I try to support our friends who are doing the same job we are, no matter how much our methods differ, because we know how hard it is. And we try to keep our own kids away from candy, and allow them some screentime. And to somehow get them to brush their teeth for longer than two seconds.